This comprehensive educational history of public schools in Hawai'i shows and analyzes how dominant cultural and educational policy have affected the education experiences of Native Hawaiians. Drawing on institutional theory as a scholarly lens, the authors focus on four historical cases representing over 150 years of contact with the West. They carefully link historical events, significant people, educational policy, and law to cultural and social consequences for Native Hawaiian children and youth. The authors argue that since the early 1800s, educational policy in Hawai'i emphasizing efficiency has resulted in institutional structures that have degenerated Hawaiian culture, self-image, and sovereignty. Native Hawaiians have often been denied equal access to quality schools and resulting increased economic and social status. These policies were often overtly, or covertly, racist and reflected wider cultural views prevalent across the United States regarding the assimilation of groups into the American mainstream culture. The case of education in Hawai'i is used to initiate a broader discussion of similar historical trends in assimilating children of different backgrounds into the American system of education. The scholarly analysis presented in this book draws out historical, political, cultural, and organizational implications that can be employed to understand other Native and non-Native contexts. Given the increasing cultural diversity of the United States and the perceived failure of the American educational system in light of these changes, this book provides an exceptionally appropriate starting point to begin a discussion about past, present, and future schooling for our nation's children. Because it is written and comes from a Native perspective, the value of the "insider" view is illuminated. This underlying reminder of the Native eye is woven throughout the book in Ha'awina No'ono'o--the sharing of thoughts from the Native Hawaiian author. With its primary focus on the education of native groups, this book is an extraordinary and useful work for scholars, thoughtful practitioners, policymakers, and those interested in Hawai'i, Hawaiian education, and educational policy and theory. 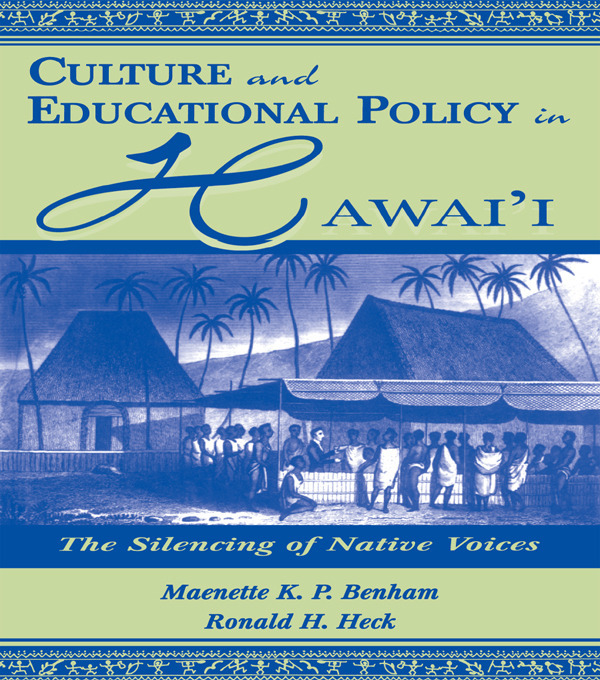 "Benham and Heck provide a rich historical account of how schooling contributed to the disenfranchisement and subordination of Native Hawaiians, but their book is of far more than local or historical interest. Instead, the story that they tell illuminates the painful political and cultural dilemmas that underlie the current debate over multiculturalism in United States schools….Their book shows how we arrived in our current fix, and suggests how we might begin to think about extricating ourselves. It is a fascinating case study, and an important contribution to current policy debates." Contents: D.N. Plank, Foreword. Preface. Ha'awina No'ono'o (A Note to the Reader on Voice). Part I: Pua I 'ako 'ia (Flower That Has Been Plucked). The Case of Marginalized People: The Great Wave Cometh. Part II: Case Histories. The Fortuitous Arrival of the American Missionaries, 1820-1840s. Hawai'i, No Longer for the Native Hawaiian. The Americanization of the Native Hawaiian, 1930s-1960s. Toward a New Hawaiian Voice, 1970s-1990s. Part III: (Epilogue): Seeking a Situated Understanding of Policy. E mã lama 'ia nã pono o ka 'ã ina e nã 'opio (The Traditions of the Land Are Perpetuated by Its Youth). Appendices: Hawai'i's Monarchy. Territorial Governors of Hawai'i. Distribution of Values Among School Policy Mechanisms (SPM), 1905-1969. Glossary of Hawaiian Language. This series focuses on studies of public and private institutions, the media, and academic disciplines that contribute to educating--in the broadest sense--students and the general public. The series welcomes volumes with multicultural perspectives, diverse interpretations, and a range of political points of view from conservative to critical. Books accepted for publication in this series will be written for an academic audience and, in some cases, also for use as supplementary readings in graduate and undergraduate courses.